This example program requires the Pick-it URCap plugin to be installed in your robot. For installation instructions of both the URCap plugin and the example programs please refer to the Getting started with the Pick-it URCap article. Before following these URCap specific instructions in this article, make sure you first understand the process of executing a robot camera calibration as explained on How to execute robot camera calibration. Download the URCap example calibration programs and load them onto your UR controller. All MoveJ commands are specified with respect to the tool flange (as opposed to the TCP). While teaching the waypoints, it is recommended to have the Calibration page opened in the Pick-it interface, where the user can verify whether the calibration plate is visible. The provided program serves as a template only, and the waypoints are not set. They must be taught by the user since they depend on the physical environment and location of the calibration plate. Guidance on how the five waypoints should be taught can be found in the article referenced above. In the Calibration page, the user can follow the progress of calibration. 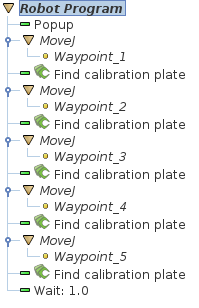 For single pose calibration, the program consists of one single calibration request.